It is always difficult to lose a close family member, and the early days after the loss are generally spent in mourning and remembrance. But in time, you may begin to wonder whether the family member left a will. Did my dad have a will? Did my aunt leave me anything in a will? These are natural questions to ask and it isn't too difficult to find out. A will is a legal document in which a person sets out who she wants to inherit her property when she dies. There is no specific format for a will. If can be written by hand, typed, printed from a computer, or even created with a fill-in form. As long as it is signed by the person making the will, termed the testator, and whatever witnesses that applicable state law requires, it is a valid document. The will itself can be very straightforward or it can be complex. The testator can leave everything to one person, or he can specify a different beneficiary for each and every asset. Generally, more complex wills require legal assistance to prepare. Each state has different requirements about witnesses. Some require that the testator's signature be witnessed by two adults. Others require a notary but no witnesses. As long as the testator complies with the law of the state where she is making the will, it is valid. If you are trying to find a will written by a family member, or find out if such a will exists, you can always ask other family members or the family lawyer. If you are trying to find your father's will, ask your mother, if she is still living, and any brothers and sisters in the family. You could also look in likely places like a safety deposit box. If you are trying to find the will of a family member who is not so close, like a distant aunt, you may not know who to ask. Luckily, you can look in the probate court in the location the testator lived out her last days. 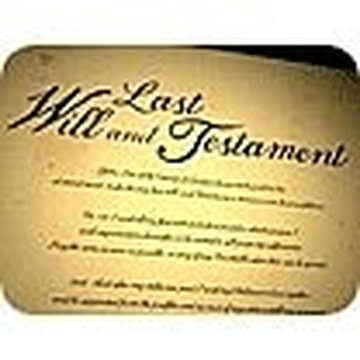 Although a will is a private document as long as the testator is alive, it becomes public when she dies. It is filed in court during the probate of the estate, and, generally, open to public viewing. If you don't know where the testator lived, look in her obituary. Both private obituaries and military obituaries contain information about where the deceased lived before death. Call the probate court in that county or region and ask how to confirm that a will was filed there. Provide the date and place of death, information you can find in the obituary. Ask whether it is possible to review the will online. Some courts provide online access to court documents. Alternatively, you can simply go to the probate court. Walk in during regular business hours and ask the clerk to help you find the file. Provide all of the information you have about the death, including the person's name and identifying information like date of birth, date of death and Social Security number, if you have it. The clerk will locate the file and allow you to review it. If there is a will, it will be near the front of the file. You can even ask the clerk to make a copy of it if you want, usually for a small copy fee. If there is a will and you are a named beneficiary, you will be contacted by the executor, the person assigned the job of getting the will through probate. One of the executor's first duties is to locate the beneficiaries and advise them of the probate. Free Legal Advice: How Can I Find Out if a Will Exists? Spengler, Teo. "How to Find Out If a Family Member Had a Will." , https://legalbeagle.com/2255202-out-relative-had-will.html. 10 October 2018.